Trade War: What Does It Mean for Business and the Economy? 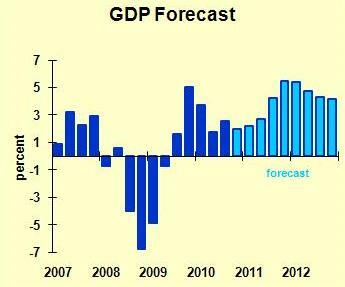 With the latest GDP report I have updated my economic outlook and extended the forecast period through 2012. It maybe looks a little better, but still not wonderful. The key to my cyclical pattern is the Fed’s quantitative easing, which I think will help the economy. Note, however, about a 12-month time lag before we see the benefit of QE2 (as the hipsters call this round of quantitative easing). Sectors with relatively strong growth: consumer discretionary spending, capital spending, housing construction and exports. How can housing construction grow? The secret to high growth rates in this sector is a very low base. A 20% gain from next to nothing is just a tad higher than next to nothing. Seriously, I think some bold developers will put up more apartments in 2012. I expect spending on consumer services, imports, defense and state/local government to show relatively slow growth, with non-defense federal spending growing at a moderate pace. Interest rates are flat in my forecast. The Fed keeps short rates low, and long-term rates gradually edge up in 2012, but stay low by historic standards. Inflation remains tame through 2011, then starts to inch up late in 2012. After two more years of economic growth, we still will not be up to our potential. Sheesh, that’s a gloomy outlook. Risks to the Economic Forecast: The biggest risk is a European recession, triggered by another credit crisis. The American economy does not have enough margin for error to survive a downturn overseas. So although my forecast is hopeful, I have raised my estimates of the risk of a double dip somewhat, in honor of our Irish cousins. The risk of a near-term double-dip is still no more than 15%, but that bears some contingency planning. The real turning point occurs late in 2012. What does the Fed do when inflation starts edging up, but we are not yet operating a full potential? Do they reverse the quantitative easing early, or do they persist until they are absolutely sure that we are out of the woods? Do they get the magnitude of the money drain just right? If they do not get the timing exactly right as well as the magnitude of their tightening, then it’s back to the cycle-coaster. Too early a tightening and 2013 is a down year; too late and the next recession is 2014 or 2015, but it’s a doozy. This is a good time to think about my comments regarding increased volatility of the economy. Business planning implications: The base case for planning next year should be moderate growth overall, then adjusted upward or downward depending on your particular sector and your market share expectations. Although inflation overall remains tame, it’s likely that commodity prices will accelerate. Then add in some contingency planning for a European recession triggering an American recession. Finally, it’s not necessary to send me a link to the cartoon video on quantitative easing. Everyone this side of Katmandu has already sent it to me. It’s funny, certainly, but the substance is stupid. Not that I can’t enjoy a cheap shot along with the best of them. This sounds like a reasonable macro economic picture. I think the inflation picture really depends on employment growth and unemployment rate. 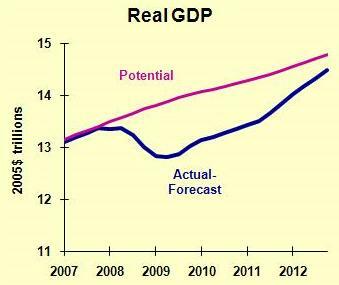 It looks from the gap between predicted GDP and potential GDP above, it’s not until 2012 when wage inflation would pick up enough to cause a ratchet up in inflation back to the Fed’s 2 percent target. If you go back to the 30s Great Depression, you saw deflation in the early part of the decade with crash but then inflation came back in the latter years of the decade and into the 40s. It looks like Obama will have a friendlier economy to run for re election in 2012. At the same time, a lot more Democrat senators are up for re election in ’12 than GOP. So, maybe gridlock will hold until 2014. If only Bama would turn towards the center ala Bill Clinton in the mid 1990s.